Now what you are going to do is going to create this with a view to using it for your customers. These can be potential customers, people that are not buying from you yet; these can be past customers, people who bought from you before but don’t buy from you at the moment. And these can be current customers, people who do buy from you. What you want to do is to remind people, to give them the confidence that your product, your services is the one for them. Now they may be nearly there, but why not reinforce? The heavier you can reinforce this the better. You can do it over and over, there is no limits to the depth you can go to to reinforce why people should buy from you. People want to have confidence in their decisions; it doesn’t matter whether it come from you, power comes from recommendations or it comes from other places. or any toy site, Hamley’s or something in the UK, Toys R Us, you will find lists, you will find the top five gifts for boys, the top five gifts for girls, the top five gifts for teenage girls. Now the reason those are popular is because we are never entirely sure what to do, we want to crowd source our confidence, we want to know that everyone else is…what is everyone else doing? And that’s why lists help and the top 10 reasons for people to buy from you is going to give them the tools to enable them to make that decision, to just clear that final hurdle. Like in their mind they are thinking, “I don’t want to be stupid, I don’t want to seem like I am getting this wrong. What have I forgotten?” Why? If everyone else does it, they will do it. Look at Apple, Apple products. Everyone has them, everyone loves them so you can feel very confident that when you buy, if you move to an iPhone from something else, you know it’s going to work, you know it’s going to be great because everyone else tells you. This is the same. So, how do you come up with the list? Because you might be thinking, well what on earth can I come up with? How on earth can I come up with ten reasons? Well, this also is a good exercise for you and your team. You may just be you, you, no staff, no team, no nothing. In which case, what I challenge you to do is to grab a piece of paper and write down as many reasons as you can possibly think of for someone to buy from you. Anything, it can even be funny. In your final list I am going to suggest that you add a couple of bits of humour to add a bit of light-heartedness to it. So any reason at all. 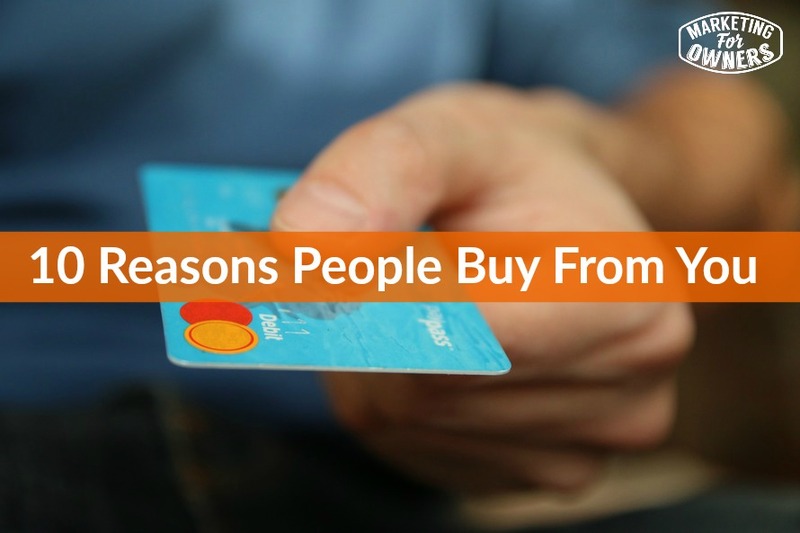 Then write down the corresponding list of all the reasons you can think of why not to buy from you. And remember you are not going to give this out, no one is going to see. If you have a team, ask every single individual person on your team that works for you to do the same. Now they work for you, why wouldn’t they want to do it? This is their job, their job is to work for the business, their job exists to help the business grow. It’s not just for them, so part of their job should be to help the business grow. In which case, we want to know what everyone else thinks and why we want to find the word, the language and this is all internal. This doesn’t even involve asking customers, so we are just going to fill this out internally. You may even want to sit in a group and ask people. Get a flip chart and write them down, get people to show them off. Collectively people quite often come up with better ideas then on their own. But if you are going to ask people, the best way is to sit them down in front of you, or sit them down and give them ten minutes or five minutes. Say I am going to set the time, five minutes to write down ten things. Don’t let them go off and bring it back tomorrow, make them do it now to a stopwatch. Get those ideas, then combine them into a list. Now once you have those reasons, ten reasons why people can buy, you need to word it in their language. Now if that’s genuine, so remember, we want to be genuine, if you know someone else has cheaper prices, that’s not a reason. Now do you see how that’s more on their mind than yours? And that’s the way I want you to think about this. Once you have that, you can go on fiverr or something, and have that created into a kind of leaflet styler. It costs you five dollars, someone who makes leaflets and flyers can create that into an interesting document and then print them out and then give them out with other information you give out. Email it to people, send people to a link, make an infographic, tweet it, put it on Facebook, anywhere. Put it on Pinterest, any excuse to get that in front of clients and get that in front of them periodically to remind them over and over and over again. Easy, eh? If you’ve got a massive video you don’t want to download it and try and email it to somebody, you just copy the link which is just for them an email them the link. They hit Dropbox and they can view the video and download it themselves. Job done. Easy eh? Anyway, another final thing, Wednesdays, our expert interview series. Now do any of you use Facebook? Have any of you tried Facebook ads? Do you know people who try Facebook ads and it didn’t work for them? Well tomorrow, fantastic, we’ve got Nicholas Kusmich. Now you may not know the name, but very simply, he’s the highest paid Facebook ads consultant in the world. He does Facebook ads for people like Tony Robbins. Do you think he might know a thing or two? You betcha. Listen in tomorrow and you will find out.